Take your chance with some of our Casinos where you can grasp some of the finest Welcome Bonuses on the market, and even win more free spins. Good luck! Ooh Aah Dracula slot is a video game by Barcrest which aims to bring a nice mix of themes, entertainment, and lots of cash to the players. The game possesses five reels and 10 paylines at your disposal, and you can spin it as soon as you find a proper casino to play the game at. Spin the reels with Denomination from £0.10 up to fantastic £500.00 where your highest win can reach up to x5.000 coin jackpot! The most impressive thing in this game is the RTP that can reach 99.00% in the bonus features, and you wouldn’t want to miss that! Check out this horror-themed game and grab some of the bonuses that we offer! When you get the perfect mix of horror and comedy, you receive Ooh Aah Dracula video slot game. Developed by Barcrest in 2015, this game has many players that are satisfied with the wheel turning and amazing graphics. There are several bonus features and an RTP that will leave your mouth open, so check it out below or click some of our sites to receive the bonuses or free spins before playing. The game has an interesting look and feels that will most definitely make everyone’s day happier and brighter. Although the dark black background of the reels might have a bit of negative impact, it is just representing the horror part of the theme. On the top of the game, you can find the logo of the game standing proud, as well as the Help option at the top left. Check out the bottom for all the adjustable features like stake/line, lines, the total win, and you can see some features like Auto Play, Bet Max, hi Roller and the magical Spin button. The symbols are shining like neon lights, and it is all placed on a wall of a castle with two towers on the side while the reels are separated by vertical chains. On the sides, however, we can see the paylines that this game offers, and if you mouse over them, they will appear on the reels, so that you know what to expect from this game. The music is the thing that will make you want to play the slot more, as it offers a bit of intense, yet interesting story to tell. 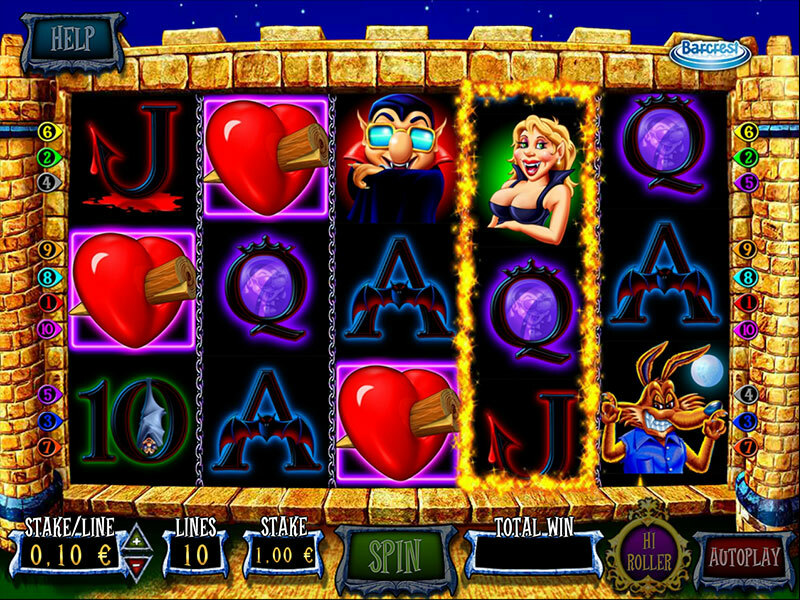 The symbols of this game, just like most of the online video slot games, are divided into two categories. The first and the lower ones are the deck of cards inspired symbols where we can see differently coloured, neon powered symbols starting from the number 10 and going to the Ace. On the other hand, we have the higher valued symbols where we can see the Game’s Logo as the higher valued symbol, and the symbol where you can win the biggest reward of the game – 5000x your stake. Other than those, we can see the Dracula himself, his castle, a lady vampire and a rabbit. Like every game, there has to be a wild symbol which will make the game more interesting, and in Ooh Aah Dracula, the Wild written over the symbol represents the Wild symbol, while the Heart is the Scatter symbol. While the wild symbol is used as a substitute and participates in the winning combination on the screen, the Scatter is here to trigger the bonus features of this game. The game has rich gameplay and several bonus features that will most definitely put a smile on your face. Check out this 5 reels 10 paylines video slot game where the Max Win is 5000x your stake. To start playing the slot game, you have to select one of the casinos that are positioned on the side of this review. Check the casinos’ ratings and welcome bonuses to make your choice. Be careful of what you choose as you will spend a lot of time on the pages of the casino, and they are responsible for your wagered money. Once that’s done, set the denomination of the slot and you are ready to play. The denomination starts with £0.10 and can be adjusted all the way up top £500.00 per spin. You can also do this with one button which is found on the reels. Since the maximum win in the game is a multiplier, it is always smart to play with as higher denomination as possible, or until your budget allows. This is where the Bet Max comes in handy. The Bet Max feature allows you to set the denomination, the coin value and number of paylines to the highest level, giving you the best opportunity to win the jackpot of the game. This feature is one of the most dangerous ones, so you better be careful how you play with it. Either come up with a plan or a limit to your money or forget about this feature completely. The other option in Ooh Aah Dracula is the Auto Play, where you set the denomination and number of spins that you wish the game to spin by itself while you are making yourself some hot tea, playing another slot game or basically doing whatever you want. Once the spins are over, you select one of the graves that will reveal your extra prize. 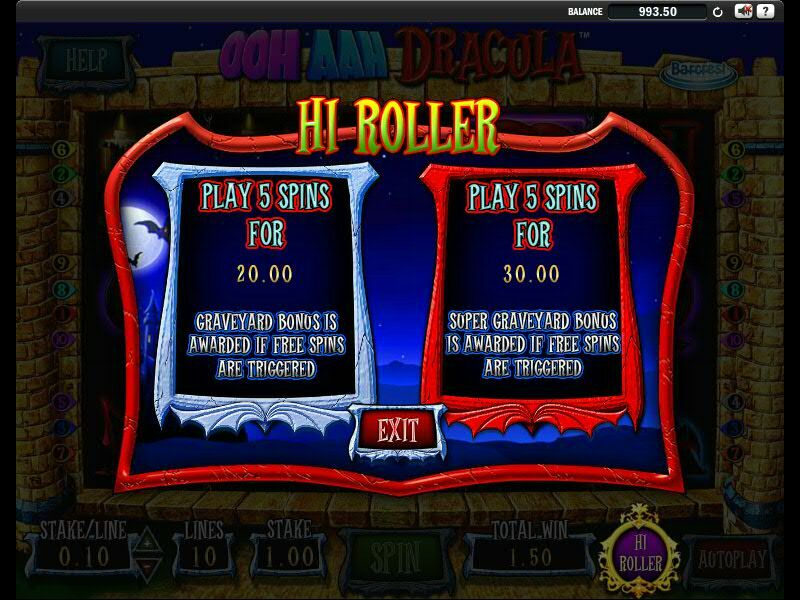 Apart from the bonus feature, Ooh Aah Dracula offers a Free Spins feature. By landing three or more of the Scatter symbol anywhere on the screen, you kick-start it this feature. When this feature starts, all the Heart symbols will freeze in place and the other positions will spin for more hearts. Four Hearts – 15 Free Spins and one random symbol as an extra Wild where you can choose to switch prizes and take 10 Free Spins and two extra Wilds. Five Hearts – 15 Free Spins and One Random symbol as an extra wild where you can switch the prize for 10 free spins and 2 Wilds, or even 5 Free Spins and 3 Wilds. RTP is an abbreviation for Return to Player, and it tells the amount of money the game returns to all of its players, in percentage, over a longer period of time. There are some tricks regarding the RTP, so you better see our Detailed RTP Guide for more information. Some of the finest games are actually the ones with the highest RTP and can offer some more cash to the players than the usual slot games. On Our article, the Highest RTP Online Slots, we can see that Ooh Aah Dracula positions on the third place. One of the first things we noticed was the increased RTP percentage when playing the Hi Roller Bet Bonus Feature. Here, instead of the standard 96.00% of RTP that you have during the regular play, you have 99.00%. Tend to play with as high denomination and coin size as possible, as it triggers more cash income and major prizes. Regarding the Auto Play, always watch what the game spins and never go completely AFK as it can hurt your budget. Two different features combined make a decent online slot game. Fine graphics and scary music, but, all go down in the sewers when we see the large percentage of RTP and the two bonus features.